- Publisher Learn to use spiritual authority to ensure your future in God. - Publisher The future begins with a dream! The heavenly Father has a special gift for each person. When he first plants this gift in their hearts, it is tiny as the smallest seed. But no one should be fooled. It has the potential to grow into something great and marvelous in both size and beauty. The gift is simply a dream. What better way for Satan to rob Christians of their future than to quench their enthusiasm for this God-given vision? And he is definitely ready with every trick he knows to sow seeds of doubt, fear, distraction, and discouragement into the believer's life. The good news is that with God's help, Satan does not have the power to take away what God has given--unless allowed to do so. That's precisely why best-selling author Jerry Savelle teaches readers biblical truths that include-- --Satan's #1 strategy for robbing individuals of their dreams --The telltale signs that indicate one's faith is wavering--and what to do about it immediately --The secrets of recapturing one's dreams --The four univeral principles of bringing dreams into reality Millions of people have the desire to be and do something extraordinary but have allowed disappointments and hardships to rob them of this vision. God is ready and able to help them recapture and dream what He has planted in their hearts. 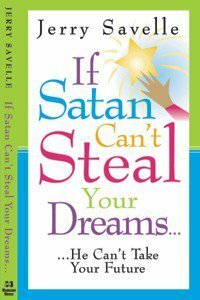 About "If Satan Can't Steal Your Dreams... He Can't Control Your Destiny"
Learn to use spiritual authority to ensure your future in God. The future begins with a dream! The heavenly Father has a special gift for each person. When he first plants this gift in their hearts, it is tiny as the smallest seed. But no one should be fooled. It has the potential to grow into something great and marvelous in both size and beauty. The gift is simply a dream. What better way for Satan to rob Christians of their future than to quench their enthusiasm for this God-given vision? And he is definitely ready with every trick he knows to sow seeds of doubt, fear, distraction, and discouragement into the believer's life. The good news is that with God's help, Satan does not have the power to take away what God has given--unless allowed to do so. That's precisely why best-selling author Jerry Savelle teaches readers biblical truths that include-- --Satan's #1 strategy for robbing individuals of their dreams --The telltale signs that indicate one's faith is wavering--and what to do about it immediately --The secrets of recapturing one's dreams --The four univeral principles of bringing dreams into reality Millions of people have the desire to be and do something extraordinary but have allowed disappointments and hardships to rob them of this vision. God is ready and able to help them recapture and dream what He has planted in their hearts.